How About Printing Your Future Home? It's Possible Now! Wait, what? You read correctly: The first houses built by a 3D printer will arrive on the market in 2019. This is insane! The first concrete house will consist of a 1,000-square-foot, three-bedroom single floor, while the others will have more than one storey. Each house will be built one after the other, so that the process can be perfected a little more each time. The choice of concrete may seem odd, but 3D printing makes this material fluid, malleable and less wasteful. Indeed, when a building is built the “normal” way, it uses more concrete than needed, producing a lot of greenhouse gases. The project is applauded as an eco-friendly initiative, especially because it avoids the pollution caused by the transport of materials. It also requires less construction time, in addition to being designed to be durable and save energy. The house’s insulation (both thermal and acoustic) is superior, and the exterior cladding is designed to repel dirt. Besides, these houses are built in Bosrijk, the only part of the city that is not near a natural gas pipeline. In this area where vegetation is abundant, these unique and futuristic houses should attract outdoor enthusiasts. The perfect marriage of nature and technology, right? Would you live in a 3D-printed concrete house? 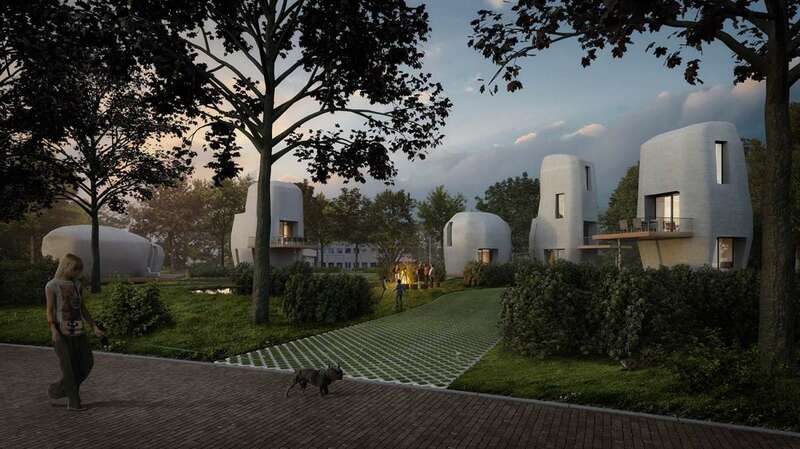 You'll have to move to Holland to discover these futuristic homes!